Besides the park tickets, lodging can be one of, if not the most expensive parts of your visit to the Walt Disney World Resort. The first decision that you need to make is whether to stay on-site at one of the Disney World Resort Hotels or off-site at one of the numerous Orlando area hotels. We have done both over the years and now we stay almost exclusively on-site. We do that because the resorts have a lot to offer and we can save money doing it. If you fly into the Orlando International (MCO) airport and stay on-site you can take advantage of Disney’s Magical Express service that transports you and your bags directly to and from your resort at no extra charge. This is a huge savings versus paying for a shuttle, towncar, or rental car. We have tried all of the options over the years and we are thrilled that Disney offers this free service. For a family this saves you close to $200 per trip. No parking fees for on-site guests. Even if you choose to drive to the theme parks, you get free parking privileges saving $14/day. This can really add up versus staying off-site and driving to Disney World Theme Parks each day and paying to to park. They have resorts for every budget. By segregating their resorts into Value, Moderate, and Deluxe, they offer solutions to meet everyone’s needs. Whether you want the lowest price or you wish to be pampered, they have options for you. Besides you can't beat the incredible theming that you will find at a Walt Disney World Resort Hotel. Take advantage of frequent discount codes for Disney World Hotel room discounts on-site. These codes can save you hundreds of dollars per trip. These are codes issued by Disney for use by the general public. They can be used for making reservations directly with Disney or through your favorite Disney Specialized Travel Agent. Time is money. By staying on-site you save on travel time and can enjoy more of your vacation. Mid-day breaks are also possible. This is a big plus when travelling with children. The Disney Theming extends to the resorts, so they are like a part of the parks. This allows another free benefit that you get more of that Disney Magic during your vacation. 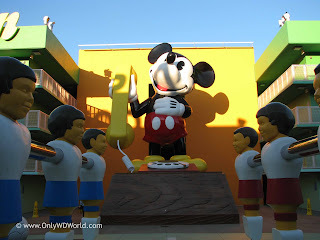 2 comments to "Disney World On A Budget - 6 Money Saving Reasons To Stay On-Site"
We are within easy driving distance of Orlando (8 hours) so the shuttle from the airport is not a factor for us. We prefer renting a condo at someplace like Windsor Hills which is only 2.5 miles from the front gate. We can easily find a 3 bedroom condo for $500 or less. We usually get a king bed, a queen bed and 2 twin beds. Much better than the doubles you'll find at Disney. Also we get free Wi-Fi and long distance phone service. True we pay $14 a day for parking, but even adding that we pay less than the cheapest room at Disney. I must also add, that we have 5 in our family, which rules out all value resorts. We save a bundle on food, too, because we eat breakfast at "home." Thanks for your blog. This offers some good points regarding staying on-site at a Disney Resort. Some off site hotels do offer free shuttle service to and from the parks as well, but the convenience of being on-site is definitely worth it.